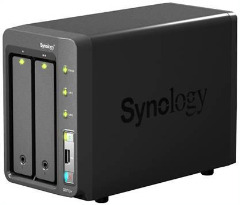 Synology® DiskStation DS712+ offers a high-performance, scalable, and full-featured network attached storage solution that meets the needs of small and medium-sized businesses that require an efficient way to centralize data protection, simplify data management, and rapidly scale storage capacity with minimal time spent on setup and management. The Synology DS712+ is backed with Synology’s 3-year limited warranty. Steel PeopleFu 8 "# 036 (W) (For Housing).